Living a Fit and Full Life: Coffee-mate Natural Bliss Cold Brew Flavored Coffee is Just What Mornings Needed! Coffee-mate Natural Bliss Cold Brew Flavored Coffee is Just What Mornings Needed! Coffeemate Natural Bliss Sweet Cream Cold Brew Coffee is expertly crafted for those who like a deliciously smooth and bold cold brew. We start with the finest, responsibly sourced 100% Arabica beans from Brazil steeped cool for 12 hours, then add fresh California milk and cream from cows not treated with added growth hormone,* and just the right touch of cane sugar. GMO ingredients? Not in our cold brew coffee! Find in the Refrigerated Coffee and Juice aisle on the West Coast in 2017 and nation-wide in 2018! Coffeemate Natural Bliss Mocha flavored Cold Brew Coffee is expertly crafted for those who like a deliciously smooth and bold cold brew with a hint of cocoa. We start with the finest, responsibly sourced 100% Arabica beans from Brazil steeped cool for 12 hours, then add fresh California milk and cream from cows not treated with added growth hormone,* and just the right touch of cane sugar and responsibly sourced cocoa. GMO ingredients? Not in our cold brew coffee! Find in the Refrigerated Coffee and Juice aisle on the West Coast in 2017 and nation-wide in 2018! Coffeemate Natural Bliss Caramel flavored Iced Coffee is a great tasting and refreshing all-natural iced coffee experience that’s simply beyond compare. It’s made with only a few ingredients, including responsibly sourced medium roast coffee, fresh California milk and cream from cows not treated with added growth hormone,* natural caramel flavor, and pure cane sugar. GMO ingredients? Not in our iced coffee. Find in the Refrigerated Coffee & Juice aisle on the West Coast in 2017 and nation-wide in 2018! Coffee-mate Natural Bliss Cold Brew Flavored Coffee is just what mornings needed! 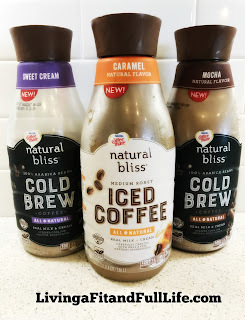 I cannot even begin to describe exactly how much I love the new Coffee-mate Natural Bliss Cold Brew Flavored Coffees. I literally go to bed thinking about drinking it in the morning. I usually just pour myself a cup in the morning but sometimes I add a little ice and blend it up in the blender for a super fancy flavored coffee drink. I love how little I have to do to enjoy a cup of delicious flavored coffee. It a mom of 4's dream come true! I also really like that Coffee-mate Natural Bliss Cold Brew Flavored Coffee is made with only a few ingredients. The milk and cream comes from cows not treated with added growth hormone and doesn't contain GMO ingredients. It's pure simple goodness that helps me rise and shine in the mornings! Click HERE to find a store near you that sells Coffee-mate! Click HERE to learn more about Coffee-mate! Follow Coffee-mate on social media!